Switzerland - IOM, UN Migration Agency, reports that 103,175 migrants and refugees entered Europe by sea in 2017 through 12 July, with almost 85 per cent arriving in Italy and the remainder divided between Greece, Cyprus and Spain. This compares with 240,014 arrivals across the region through 12 July 2016. Data on deaths of migrants compiled by IOM's Global Migration Data Analysis Centre. All numbers are minimum estimates. Arrivals based on data from respective governments and IOM field offices. IOM Rome spokesperson Flavio Di Giacomo reported that, as of 9 July, 86,121 migrants had arrived in Italy by sea. He explained that the total does not include most of the 7,721 migrants rescued in the central Mediterranean route between Monday (10 July) and Wednesday (12 July); by Thursday evening only about 900 of those recently rescued men, women and children had been brought to land. IOM Libya’s Christine Petré reported that on Thursday (13 July), 263 migrants were rescued at sea in two separate incidents. In the morning, 123 migrants were rescued off Azzawyah, five of whom were transferred to a hospital where they received medical assistance from IOM partners. Some hours later, a further 140 migrants were rescued off Tripoli. Upon disembarkation, these migrants received medical assistance and were transferred to Trig al Shook detention centre. Through to 13 July, nearly 11,000 migrants (10,994) have been rescued in Libyan waters in 2017. IOM Libya also reported that on 10 July, the remains of one man were found in Al Maya, west of Tripoli. The total number of bodies retrieved so far in 2017 is now 348. This latest confirmed fatality is not included in today’s Mediterranean total of 2,357. Although this figure trails the number of deaths (2,989) recorded by this time last year, it nonetheless marks the fourth consecutive year migrant deaths on the Mediterranean Sea have exceeded 2,350. 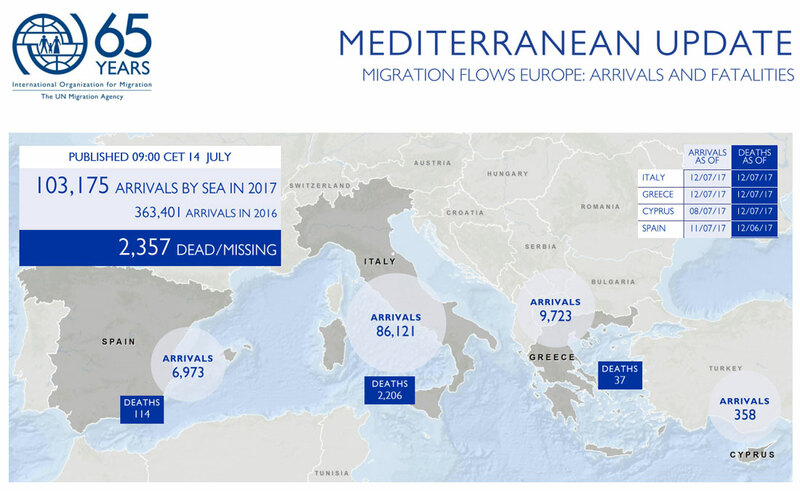 Worldwide, the IOM Missing Migrants Project (MMP) reports that there have been 3,228 fatalities in 2017 through 12 July (see chart below) with the Mediterranean region accounting for the largest proportion of deaths – almost three quarters of the global total. MMP reports a substantial increase in fatalities in Sub-Saharan Africa and the Caribbean Sea compared to this time last year, but fewer deaths in the Middle East and South America where, so far in 2017, MMP has processed no reports of confirmed fatalities. Deaths are also up in Europe, South Asia and Southeast Asia and virtually identical to levels recorded by this time last year in the Horn of Africa region and along the US-Mexico border. The one region where fatalities are substantially down this year from 2016 is North Africa, where 265 have been reported dead this year, compared to almost 900 by this time last year. MMP researchers explain the discrepancy in that IOM’s receipt of data from the region tend to arrive quarterly rather than on a daily or weekly basis, as occurs in other parts of the world. The newly listed fatalities in the MMP database since IOM’s last report on July 11 include: four deaths in the Western Mediterranean (three victims’ bodies recovered off the coast of Al-Hoceima, Morocco, by the Moroccan Coast Guard; one body retrieved southeast of Malaga by the Spanish Coast Guard); and one death in Ventimiglia, Italy, near the French border (vehicular accident).